In last part of the series of the articles, we have made a sample project to load the PostgreSQL JDBC driver into the running Java virtual machine. 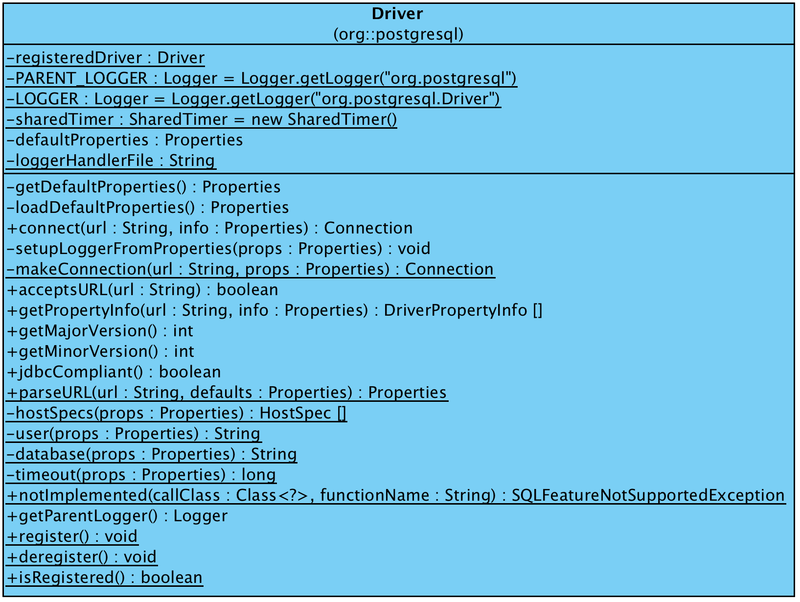 In this part, we will examine the JDBC driver startup process. The above line of code used the java.lang.Class.forName(...) method to invoke the class loader to load the org.postgresql.Driver class. The org.postgresql.Driver class implements the java.sql.Driver interface, and it provides the methods to connect to the underlying database server. Database vendors should implement their own drivers. From the users perspective, they can use the standard JDBC APIs to connect to the underlying database system without worrying about the differences between database vendors. From above code, we can see that an instance of org.postgresql.PgConnection class is created. PgConnection is a huge class that wraps the calls and operations to underlying database. We will check the detail of this class later. // my early jdbc work did - and that was based on other examples). // Placing it here, means that the driver is registered once only. The above code defines the properties of our local database server, and pass it to java.sql.DriverManager to get the connection. Because the org.postgresql.Driver has been registered into java.sql.DriverManager, so it can find the the correct driver and call it the make physical connections to underlying database system. 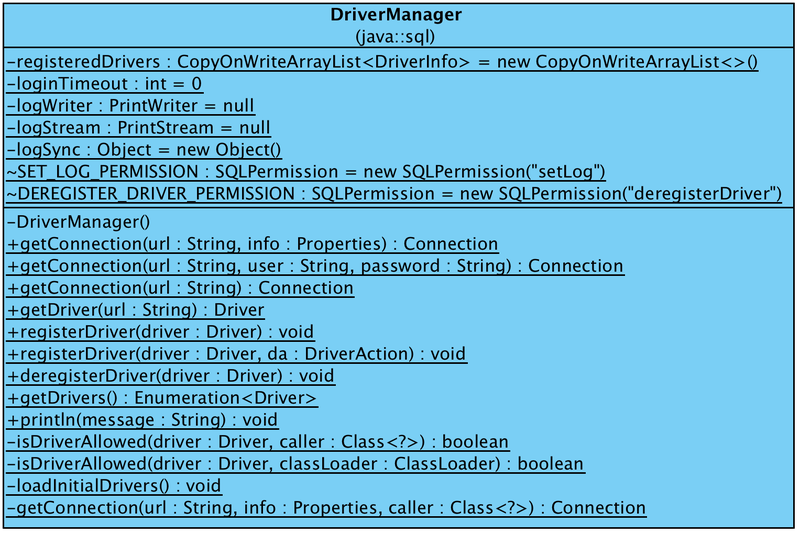 From the above code, we can see java.sql.DriverManager will check each registered database driver, and try to use it to handle the connect request. If a driver can handle the connection, it will return the java.sql.Connection class. For PostgreSQL driver, it will return the PgConnection class instance. We have seen this in makeConnection(...) method of org.postgresql.Driver class, which is called by the connect(...) method. Until now, we have learned the loading process of the JDBC driver. In addition, we hav checked how does JDBC manages the drivers and use them to interact with the underlying database system. In the next part of the articles, let’s check the java.sql.Connection and org.postgresql.PGConnection classes in detail.